You need to regularly back up your data to a safe location, such as Samsung Cloud, Google Account or a computer, so that you can restore it if the data is corrupted or lost due to an unintended factory data reset or device is lost. Regularly sync, back up your device’s data using Samsung Cloud, Samsung account or Google account, or transfer data to PC via Smart Switch. Also, you can use the various 3’rd Cloud applications to back up data. 1. 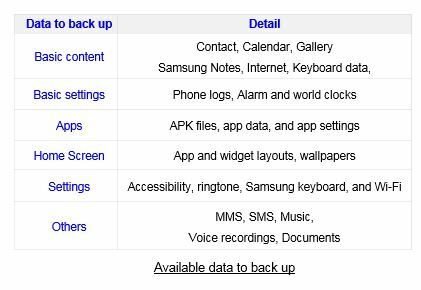 Using Samsung Cloud : Back up data to Samsung Cloud and restore the data later. You must register and sign in to your Samsung account to use Samsung Cloud. 2. Using Google or Samsung account : Keep your personal information, app data, and settings safe on your device. 4. Back up data to computer : Transfer data between your device and a computer. You must download the Smart Switch PC version app from www.samsung.com/smartswitch. Back up data from your device to a computer and import the data to your device later. You can manage the content that you want to store securely in Samsung Cloud. You can keep your personal information, app data, and settings safe on your device. Tap the Back up my data and tap the switches next to the items you want to back up to activate them, and then tap BACK UP NOW. Data will be backed up to Samsung Cloud. 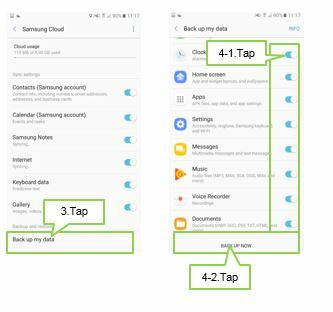 To set the device to automatically back up data, tap the Auto back up switch to activate it. Especially, Google Photos supports free, unlimited storage for high-quality(great visual quality at a reduced file size) and free 15GB to account storage for original(full resolution that counts against your quota) based on upload size for photos and videos. We recommend to backup and sync your photo, video contents regularly by using this Google Photos. 2. Activate Back up & sync option. Please note you need to sign in Google Account to back up and sync. 3. Select files to back up to your cloud storage and tap back up now. copy option. Any pictures or videos backed up already to cloud storage will be safe even the files from device are deleted. 1. On the computer, visit www.samsung.com/smartswitch to download Smart Switch PC version. 2. On the computer, launch Smart Switch. If your device is not a Samsung device, back up data to a computer using a program provided by the device’s manufacturer. Then, skip to the fifth step. 3. Connect your device to the computer using the device’s USB cable. 4. On the computer, follow the on-screen instructions to back up data from the device. Then, disconnect your device from the computer.